While the big guys were away at Scout Camp, Brady had his first solo friend sleepover. We invited his good buddy Wesley to join us for a Woodlands fun day and then a sleepover at our house. It was a very fun and special day for all! Wesley & Brady buckled up and ready to start the fun! First stop was Pump It Up. They had such fun jumping and climbing and sliding. They did silly tricks under the guise of teaching lessons in "what you should not do" and also pretended to be spies, finding all the secret hiding spots. Cuties! Then we went to Chuck E Cheese for fun and games and pizza!! Wesley hit the jackpot on the Pirate Wheel, scoring 100 tickets! Brady playing one of his favorite games, Monkey Ball. They even braved a close encounter with Chuck E Cheese so that I could take a picture to capture the memory of this fun outing. We had to make a quick stop at Starbucks so I could get some coffee!!! And the boys were treated to yummy cake pops. After playing at home for a while, they decorated homemade sugar cookies. Mmmmm, heart-shaped icing sprinkle goodness. These guys are both legomaniacs so they had a great time playing Legos together, creating all sorts of things, and doing little shows together. We ended the evening with a movie night - the Lego Movie, of course. 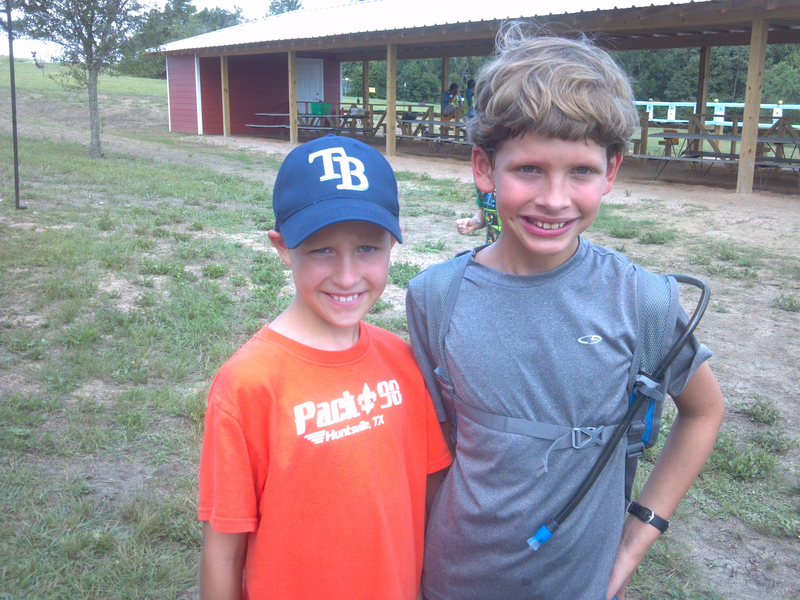 This summer, Dawson attended an overnight scout camp at Bovay Scout Ranch. Randy took him and his good friend Seth (whose Dad couldn't come because of responsibilities at work), and there were several other boys from his Pack there as well. Randy was kind enough to take some pictures for me so I could get a glimpse of all the fun adventures of scout camp. The report from camp was that it was extremely hot (big surprise, being that it was July in Texas), but that it was super fun! The activities were great, there were lots of them, and the boys really enjoyed spending time together. The favorite activities were archery, BB guns, canoeing, and the rock wall. And the pool was a big highlight as well. 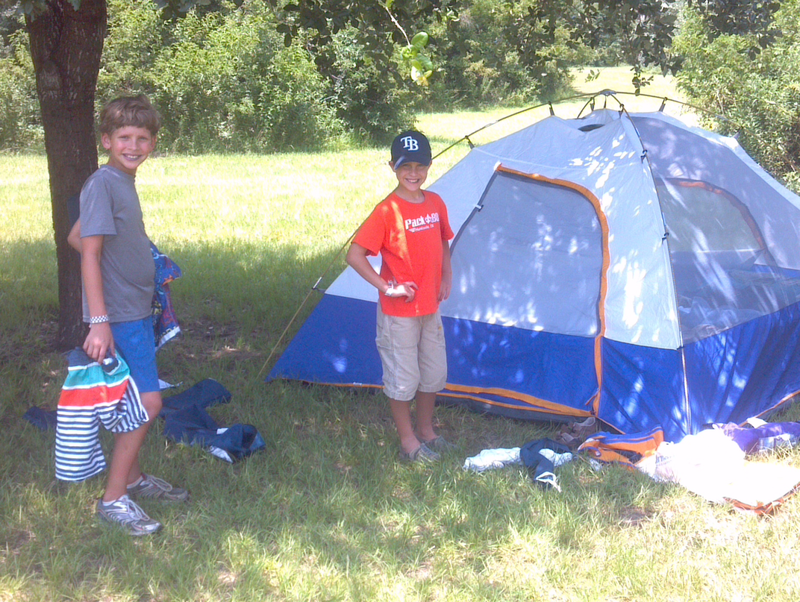 Dawson and Seth outside their newly pitched tent - which they pitched all by themselves!! Always one of Dawson's favorites - archery. Dawson's arrows, all in a line. Canoeing masters! They set a record on the canoeing course and were awarded "the magical fish of Bovay" at a campfire ceremony. Cooling down with a slushee. Getting safety instruction from the lifeguards before going into the pool. 2 thumbs up for the cool pool! Dawson, Seth, & Ben waiting in line in the cafeteria. Dawson in his Webelos shirt. They had to wear their Class A shirts to dinner each night. Their group did the flag ceremony on the last day. Here, they are lined up, waiting to begin. Campfire! The campfire programs were great - lots of silly songs, skits, and laughter. "The magical fish of Bovay" prize for winning the canoe contest.